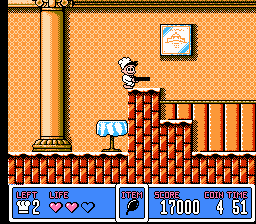 This here is the Japanese version of Panic Restaurant. 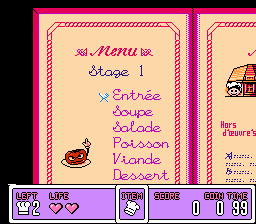 There’s a lot of differences, mostly the fact that they changed that freaky chef kid into some freaky old chef man. WHY? 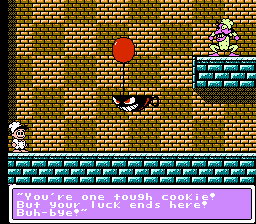 Taito also made the game harder for the U.S. release, changing around where items go, and removing some altogether. Fortunately Toma is here to translate the original, lovable Japanese version for us all. It’s really fun, but how can whacking various edible sentient objects with your head NOT be fun? What can I say, it’s just a nice silly fun platformer that everyone needs to find and play. Oh, and there’s a funky bonus game where you catch fish. It’s neat! 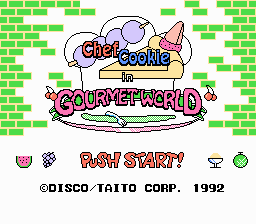 This is a complete translation for Chef Cookie in Gourmet World.